Today I am here with Chocolate Coconut Muffins. 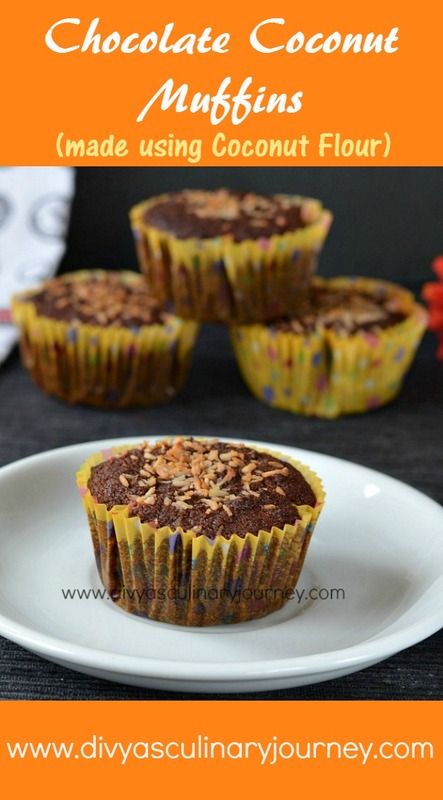 These muffins are baked using Coconut flour. I had to bake with coconut oil and I wanted to make it more "Coconut'y". So when I found Coconut flour in the baking aisle of the grocery store, without a second thought, I brought it home. Then I realised coconut flour is much different from the regular flour and it acts differently. I read so many articles on-line and did couple of experiments and finally came up with this recipe. Coconut flour recipes calls for a lot of eggs, I didn't want my muffins to be egg'y, instead I used flaxseed powder mixed with water and used only 2 eggs in this recipe. Also this recipe has coconut oil instead of butter and coconut milk in place of regular milk. The muffins came out so moist and delicious. Our family loves coconut and so I was confident that they will love it and I was right. My kids totally loved it. 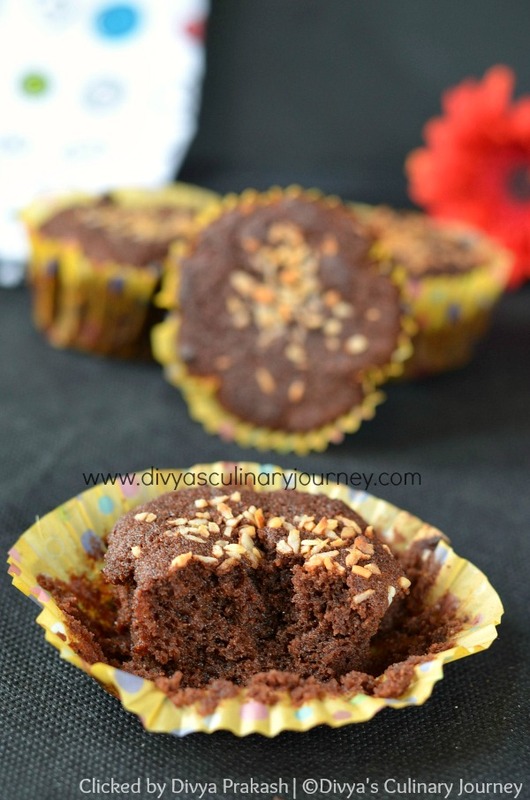 These soft and moist chocolate muffins are made with coconut flour. These are gluten free, dairy free and grain free. Eggs (large) : 2 nos. Preheat the oven to 350 F/ 180 C / 160 Fan / Gas mark 4. Prepare the baking pan by lining with liners. In a bowl, add ground flaxseed mix it with 6 Tablespoons of water and keep it aside for 10 minutes till it forms a gel like consistency. In a bowl, combine together coconut flour, unsweetened cocoa powder, baking soda and salt. Beat eggs, to it add sugar mix well. Then add honey, coconut milk and coconut oil and mix well. Add this egg mixture to the flour mixture little by little and mix well. Then add the ground flaxseed mixture, vanilla extract and mix well. Finally add vinegar and mix it well. 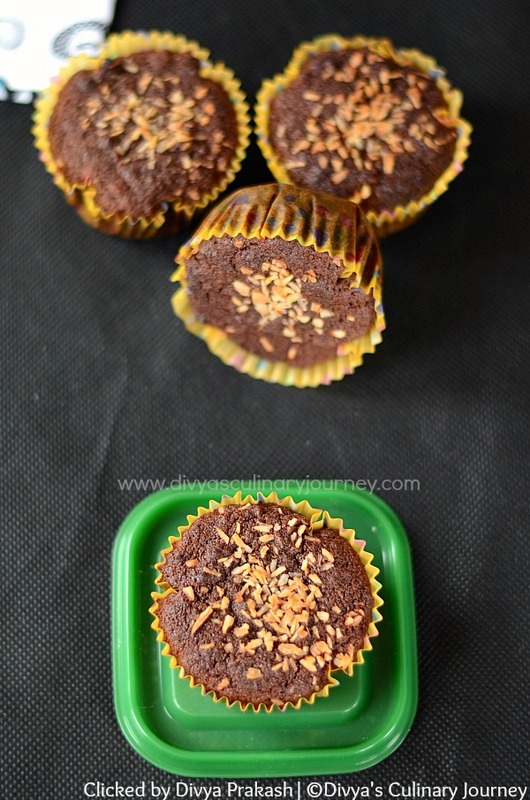 Divide the batter equally and fill the 12 muffin cups, then add desiccated coconut to the top of each cup and bake them for 20- 25 minutes till it is done. The tester inserted in the centre has to come out clean. Remove them from pan, let it cool completely then enjoy the muffins. Baking time varies with each oven, check yours accordingly. These muffins took about 23 minutes in my oven.